Ask grammar school students to draw a picture of a scientist and you’ll most likely get something that looks like Albert Einstein, says Blake Riggs, an assistant professor of cell and molecular biology at San Francisco State University. To that end, the 41-year-old Riggs is using his own story of prejudiced encounters, personal stumbles, and the eventual discovery of his own tenaciousness in order to help increase diversity in the sciences. 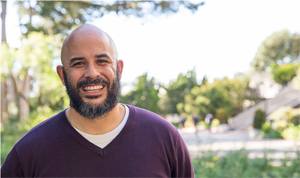 Of the eight science students he has helped get into Ph.D. programs while working at San Francisco State University, Riggs says, six have been students of color. Riggs grew up in the Baldwin Hills area of Los Angeles, raised by a father and stepmother who believed strongly in education. Smart and athletic, Riggs missed getting into his school district’s gifted track because he hadn’t taken the qualifying test in fourth grade. “It kind of put a chip on my shoulder,” said Riggs, who watched enviously as his classmates got coveted spots in AP classes. He got good grades, was on the football team, played the trumpet in the orchestra, and was class vice-president. “I had this, ‘I’ll show them,’ mentality,” Riggs said. Planning to go into the Navy, he got an acceptance packet from UC Santa Cruz the day before he enlisted and decided to switch paths. But it was not an easy time on the campus. Speaking by phone from his university office, he tells of feeling like an outsider when he first got to UC Santa Cruz and of once being told by a supervisor that he’d been accepted for a research position only because he was African American. A sense of isolation and a lack of maturity caused Riggs to draw inward, which made it seem as if he wasn’t committed to a science degree, he says. Then three things happened that changed the course of his life. Riggs was selected as a MARC (Maximizing Access to Research Careers) scholar, which aims to help underrepresented students succeed in science. He discovered a mentor in Professor of Molecular, Cell and Developmental Biology William Sullivan. And, finally, he found himself working as a telemarketer when, despite a strong finish with his undergraduate degree, he couldn’t quite crack the biotechnology job market. “I felt once I did telemarketing, I was at a low point in my life,” said Riggs, who had tried unsuccessfully to get into graduate school and, instead, had spent two years working for the Americorps program in disadvantaged schools before the phone sales job. His research experience was not without its rough spots but he earned a Ph.D. in molecular, cell and development biology, did post-doc work at UC Berkeley, and then landed the job at San Francisco State, where he runs a lab that is working to better understand the process of cell division and selection of cell fate. But it is his efforts to bring students of color into science that most interests him. Students he mentored are now in Ph.D. programs at Harvard, UC San Francisco, Stanford University, University of Texas Southwestern, and the University of Kobe. All are students of color. Last year, Riggs was awarded a prestigious National Science Foundation CAREER grant for excellence in teaching and research.